Opened: January 11, 1976 at the Winter Garden Theatre, NYC. Closed: June 27, 1976; Ran for 193 performances. Pacific Overtures tells the story of Japan's emergence from a small country content in its isolation from the rest of the world to its current position at the forefront of international politics. The play spans almost 120 years, beginning with Comm. 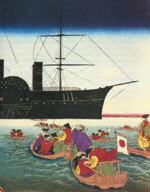 Matthew Perry's initial confrontation with the "Floating Kingdom" in 1853. It chronicles the sacrifices the Japanese people had to make in their social order, customs and dress in order to achieve their current affluence. The style of the musical is based on the ancient form of Japanese theatre known as Kabuki, and unlike previous Broadway musicals which had only attempted to capture the flavor of the East, Stephen Sondheim's score is an accurate recreation of Oriental music. 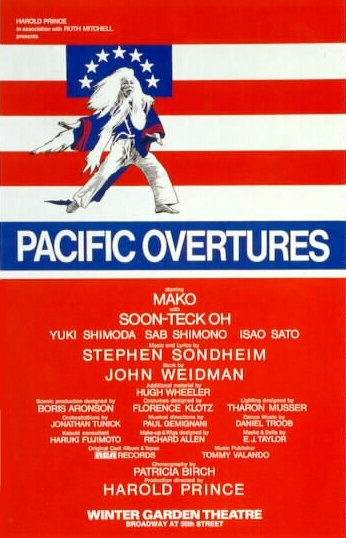 Pacific Overtures opened at the Winter Garden on January 11, 1976 under the direction of Harold Prince. The production ran for 193 performances and went on to win Tony Awards for "Best Costume Design" and "Best Scenic Design." The original cast included Mako, Soon-Teck Oh, Yuki Shimoda, Sab Shimono and Isao Sato.